Pavers are good for a pool deck because they are foot-friendly and provide good traction (NRC Landscape Construction, Vienna, Va.). Nick Hanna of NRC Landscape Construction, Vienna, Va., says that his customers like pool-deck pavers because they are foot-friendly and provide good traction. “Pavers come in many different textures. Some pavers have dimples in them, and customers say they feel soft on bare feet. Most pavers also surpass ADA guidelines for traction,” he says. Concrete pavers also come in a wide array of colors, shapes and sizes, permitting you to create design schemes that complement your pool’s shape and style. You can also use the pavers to build raised seat walls, pillars or planter boxes that will coordinate with the pool deck itself. Another advantage of using pavers for pool decks is that they can be spot replaced, if necessary. “If there is a problem with plumbing or electrical, you can lift the pavers and perform your repair,” says Hanna. Also, if you want to add on to your pool deck at a later time, it’s easy to install matching pavers and create a seamless transition. One drawback of pavers is the cost, which tends to be higher than stamped and colored concrete. However, they offer great long-term value because of their ease of maintenance and resistance to cracking and settling. Concrete pavers will resist the growth of algae and mildew in wet pool deck environments (NRC Landscape Construction, Vienna, Va.). Because factory-made concrete pavers are very dense and nonporous, they resist the growth of algae and mildew in wet pool deck environments, especially if they are protected with a sealer. Ramirez recommends filling the joints between pavers with a polymer sand, which contains a special polymeric additive that binds and hardens the sand and helps to prevent erosion. “If joints are filled with polymer sand at original installation, the need to refill joint sand in 2 to 3 years is usually eliminated,” he says. Typically, the only regular maintenance required for a paver pool deck is sweeping and occasional rinsing to remove dirt and leaves. Concrete pavers may settle in spots over time if they aren’t installed properly over a stable subbase. However, they can easily be reset with no noticeable patchwork. Simply remove the affected pavers, regrade and recompact the subbase, and reinstall the pavers. 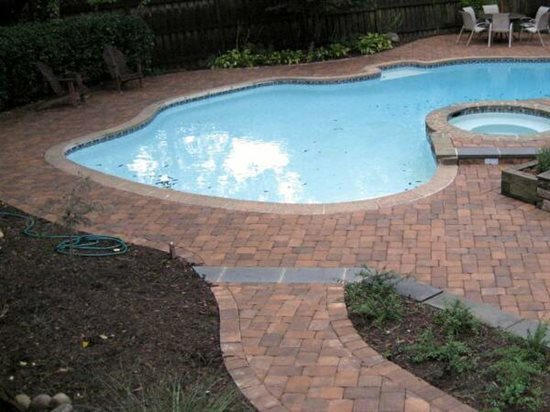 To ensure the best performance, use a minimum of 6 to 8 inches of well-compacted base material and a 1-inch sand setting bed when installing paver pool decks. Hanna recommends using concrete pavers that are protected with a UV-resistant sealer to resist fading. Keep your pool deck cooler by avoiding the use of dark-colored pavers, which will absorb more heat.